The Denver Broncos put forth an all around team effort in Week 14, limiting the visiting New York Jets to just 100 total yards, pulling out a 23-0 victory in the process. Denver allowed just 60 yards through the air in the contest to both Jets quarterbacks Josh McCown and Bryce Petty while Broncos QB Trevor Siemian finished the afternoon completing 19-of-31 passes for 200 yards and a touchdown. The Jets averaged just 2.1 yards per play on offense in this one, and punted the ball eight times in an all out dud of a day for New York. Denver kicker Brandon McManus knocked home three field goals in the win and with that, we give you our PFF-exclusive takeaways from the contest for each team. Thomas was a reliable target for Trevor Siemian the entire game, catching eight of his 11 targets for 93 yards and a touchdown. A drop that could have gone for a first down was his only black mark on his stat sheet for the game and prevented his grade from being much higher. When covered by Morris Claiborne, Thomas hauled in 6-of-8 targets for 75 yards and a touchdown. Siemian saw a passer rating of 128.2 when targeting Thomas on the afternoon. Even though the Jets focused on getting rid of the ball quickly, Miller was still able to have an impact on the game as a pass-rusher. The Denver star picked up a sack and two quarterback hurries on just 25 pass-rushing snaps while he also beat his blocker on a couple occasions just to see that the ball had already left the quarterback’s hands. In addition, Miller was a force against the run as well and recorded three run stops. Marshall led his team in both tackles (five) and defensive stops (five) against the Jets on Sunday afternoon. Furthermore, he was nearly unblockable for Jets offensive linemen as he read run plays quickly and attacked the line of scrimmage before the Jets linemen could reach the second level. While he slightly struggled in pass coverage, he made up for it with his pass-rushing and picked up a sack on his only play rushing the passer. Petty entered the game after starting quarterback Josh McCown’s injury and while his stats did not look good, they do not tell the entire story. Although Petty had only eight aimed attempt all afternoon, he was actually on target with five of them, but was victimized by three dropped passes from his wide receivers. Anderson seemed to struggle all afternoon as he had trouble hauling in even easy passes and dropped two of his five catchable targets on the day. While fans have gotten used to Anderson making big plays, the Jets wide receiver’s longest reception went for just 13 yards as he caught three passes for only 27 yards and was the intended target on the Jets’ only interception of the day. Bass, who rotates in on the defensive edge for the Jets, has been making a case for more playing time. 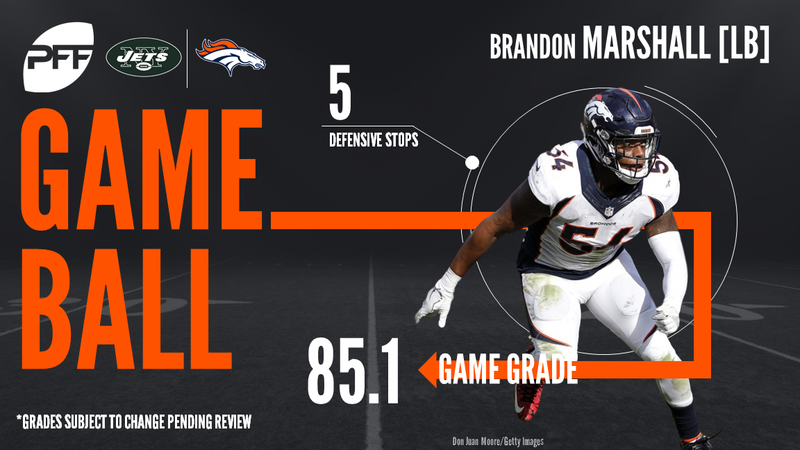 He had the best game of his season in Denver as he was solid in run defense making two stops, and added two hurries and a sack rushing the passer on just 11 pass-rushes. Bass finished with an 80.3 pass-rush grade and an 80.1 run defense grade. Maye had a very complete game at safety for the Jets on Sunday in a losing effort. Maye made four tackles, all of which resulted in stops. Although Maye is usually far back as a deep safety, he was only targeted once in 35 snaps in coverage and it only went for three yards. He finished with a 85.3 coverage grade and a 78.1 run defense grade.